4 Extra Debut. Penny Woolcock investigates who sprayed a marriage proposal on a Sheffield bridge, creating a controversial landmark. From August 2011. 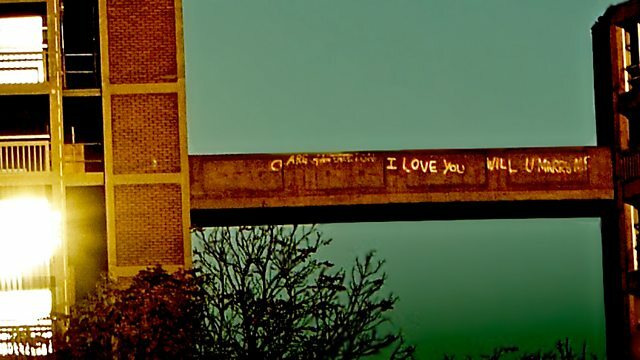 A quest for the original lovers of the 'I Love You Bridge' - a fabulously incongruous message painted on a footbridge on a hollowed-out housing estate in Sheffield. Presented by feature film maker, opera director and screenwriter, Penny Woolcock, in her first radio documentary. We call it The I Love You Bridge. It's visible for miles, from town. When we set off on this journey we don't know who wrote it or when, or even if it all went up at once. We don't know whether she said 'Yes' or what happened next. Nobody knows, not even the people who've worked on the Estate for years - caretaker, needle exchange worker, decorator, or the few (like writer, Rowan, above) who still live there; not even the local builders who are regenerating the first flank that the bridge links. In this programme we follow up all kinds of rumours in the hope of sourcing the graffiti and its lovers. A Rockethouse Production for BBC Radio 4.